Cervical stenosis is a narrowing of the cervical spinal canal. This narrowing of the spinal canal may result in compression of the spinal cord and/or the nerve roots and affect the function of the spinal cord or the nerve, which may cause symptoms associated with cervical radiculopathy or cervical myelopathy. Spinal stenosis may occur as a result of spondylosis (degenerative changes in the cervical spine) but can also be the result of traumatic (fractures and instability) and inflammatory conditions or caused by herniated discs or tumours. The cervical spinal canal normally provides enough room for the neural elements. 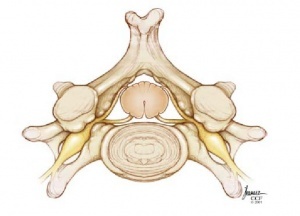 The sagittal diameter of the spinal canal varies with height and between individuals. The first cervical vertebral body (C 1) is about 21.8 mm high and the spinal cord makes up about 50% of the spinal canal. On the other hand C 6 is about 17.8 mm in height and the spinal cord takes up about 75% of the spinal canal. Lee et al described the average anterior-posterior canal diameter (and standard deviation) in all specimens at all levels was 14.1 +/- 1.6 mm. The canal diameters ranged from 9.0 to 20.9 mm, with a median diameter of 14.4 mm. Men had significantly larger cervical spinal canals than women at all of the levels that were evaluated. Although congenital stenoses are possible, stenoses are usually the secondary consequences of space occupying lesions such as progressive disk degeneration, accompanied by disk protrusion, ventral spondylophyte formation, thickening of the ligamenta flava, and hypertrophy of the dorsal facets. Meyer et al describe how movement affects the diameter of the spinal canal and cord. The diameter of the spinal canal in flexion and extension is reduced. During extension, the ligamentum flavum is folded, which further constricts the spinal canal. Moreover, the changes in length of the spinal canal also affect the length of the spinal cord. For example, the shortening of the spinal cord in extension is linked to an increase in diameter. Particularly if spinal stenosis is present, the spinal cord can be additionally damaged by movement. It is pinched between the pincers of the posteroinferior end of one vertebral body and the lamina or ligamentum flavum of the caudal segment. These mechanisms not only cause local damage to the spinal cord, but also compress the vessels perfusing it. On the one hand, the anterior spinal artery can be directly compressed. On the other hand, the flattening of the spinal cord can cause torsion in the sulcus vessels, which run transversely. These vessels perfuse the grey matter and the medial white substance, which are typically affected early in the course of the disease. Cervical spine stenosis appears to be very common. It has been estimated that cervical stenosis was present in 4.9% of the adult population, 6.8% of the population fifty years of age or older, and 9% of the population seventy years of age or older. Most patients’ symptoms chronically deteriorate over the years. Deterioration can occur rapidly and is then mostly irreversible. 75% of patients suffer phases of neurological deterioration. There is evidence that about 5% of all patients with asymptomatic spinal cord compression become symptomatic each year. There are also patients with an acute clinical course. These are mostly patients with significant but asymptomatic stenosis who suffer acute spinal cord compression after a trivial injury. Cervical stenosis does not necessarily cause symptoms, but if symptoms are present they will mainly be caused by associated cervical radiculopathy or cervical myelopathy. The disc or bone material (or both) that are causing spinal cord compression are removed from the anterior aspect and the spine is stabilised. The stabilising of the spine, which is called fusion, involves placing an implant between the two cervical segments to support the spine and compensate for the bone and the disc that has been removed. Laminectomy without fusion or with instrumented fusion: This is a procedure where the bone and ligaments that are pressing against the spinal cord are removed. In this treatment the surgeon might add also a fusion to stabilize the spine. The posterior approach relies on the decompression by both the direct removal of offending posterior structures and indirect posterior translation of the spinal cord; thus, patients should undergo maintenance of lordosis or correctable kyphosis to permit adequate indirect decompression. The distinction between these two types operations, depends on the location of the cord compression, number of levels involved, sagittal alignment, instability, associated axial neck pain, and risk factors for pseudarthrosis. Laminoplasty is more effective to laminectomy without fusion because it decreases perineural adhesion and late kyphosis. The anterior techniques as well as the laminectomy with fusion are less effective than the laminoplasty. The laminoplasty preserves motion segments and prevents fusion-related complications, including bone graft dislodgement, pseudarthrosis, and adjacent segment disease. After the surgery, the patient has to remain in the hospital for several days. A postoperative rehabilitation program may be provided, so that the patient can return to his activities and his typical daily function. This program consisted of an early post-operative ROM exercise, with or without a neck-collar. Stretching exercises: These exercises are aimed at restoring the flexibility of the muscles of the neck, trunk, arms and legs. Manual therapy: Cervical and thoracic joint manipulation to improve or keep range of motion. Heat therapy: to improve blood circulation to the muscles and other soft tissues. Cardiovascular exercises for arms and legs: This will improve blood circulation and enhance the patient's cardiovascular endurance and promote good physical conditioning. Aquatic exercises: to allow your body to exercise without pressure on the spine. Training of activity of daily living (ADL) and functional movements. Specific strengthening exercises for the arm, trunk and leg muscles. Planning ahead so that you take breaks in between potentially back-stressing activities such as walking and yard work. Proper lifting, pushing, and pulling. ↑ 1.0 1.1 1.2 Meyer F, Börm W, Thomé C. Degenerative cervical spinal stenosis: current strategies in diagnosis and treatment. Deutsches Ärzteblatt International. 2008 May;105(20):366. ↑ 2.0 2.1 Lee MJ, Cassinelli EH, Riew KD. Prevalence of cervical spine stenosis: anatomic study in cadavers. JBJS. 2007 Feb 1;89(2):376-80. ↑ 4.0 4.1 4.2 North American Spine Society Public Education Series. Cervical stenosis and myelopathy. http://www.spine.org/Documents/cervical_stenosis_2006.pdf (Accessed 22 November 2011). ↑ 5.0 5.1 Williams SK, et al. Concomitant cervical and lumbar stenosis: Strategies for treatment and outcomes. Semin Spine Surg 2007;19(3):165-176. ↑ Countee RW, et al. Congenital stenosis of the cervical spine: Diagnosis and management. J Natl Med Assoc 1979;71(3):257-264. ↑ H. Chikuda et Al., Optimal treatment for Spinal Cord Injury associated with Cervical canal Stenosis( OSCIS): a study protocol for a randomized controlled trial comparing early verus delayed surgery, BioMed Central, 2013. 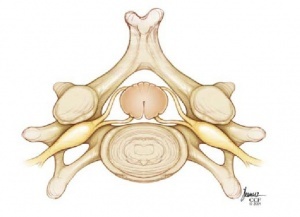 ↑ 13.0 13.1 Atlas SJ, Delitto A. Spinal stenosis: surgical versus nonsurgical treatment. Clin Orthop Relat Res 2006; 443:198.